Hope you enjoyed your weekend away Susie. 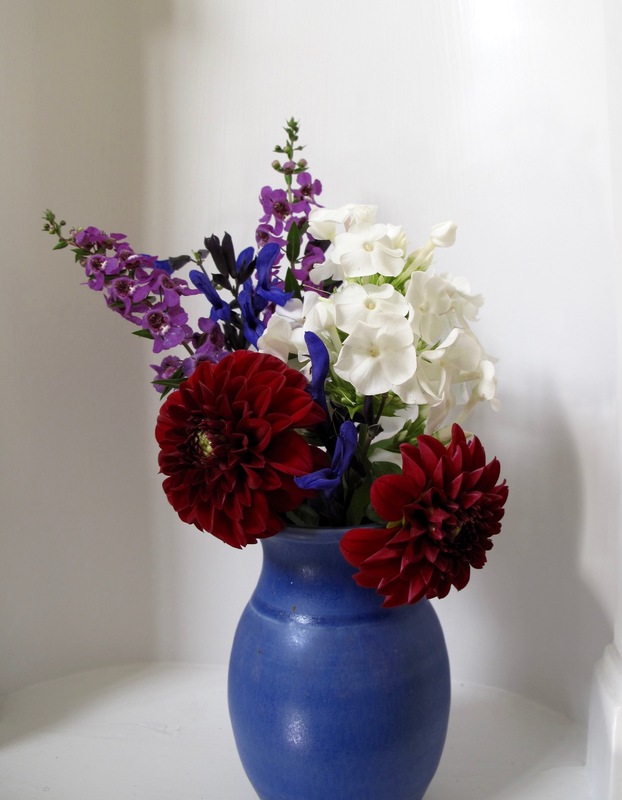 Your vase this week is as you say full of vivid rich colour. It was wonderful to get to the ocean. Over too quickly but hope to make another visit soon. I love the strong mix of colors. The flower colors are so intense I hoped the white phlox would cool it down a bit. Thanks Cathy. I’ve fallen for dahlias lately. The weekend was peaceful at times, but with lots of healthy laughter as well. A yoga retreat at the beach sounds fabulous! And what a beautiful mix of deep colors that I don’t see right now in my garden! Donna, the retreat was nice. We did yoga 4 times, meditated, chanted, sketched/painted, laughed and laughed. Deep, rich, jewel tones – love it! Eliza, I agree–they look like jewel colors. Quite striking in that particular vase. 🙂 Hope you had a great weekend. Thanks Judy. The weekend was great–restorative, even. It’s a great color mix, Susie, and balances the color of the vase perfectly. I hope you enjoyed your retreat! Thanks Kris. That little blue vase is a favorite color and it seems to blend fine with any other color. The retreat was great. I really had been wanting to get to the beach so it was nice to combine yoga with the water. 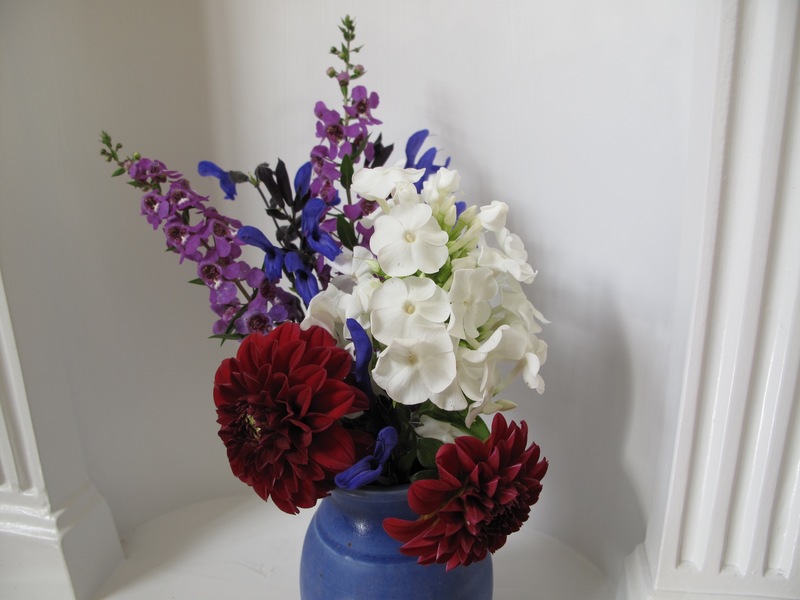 Love those deep red dahlias and the Angelonia. Jason, the dahlia is tall with lots of foliage, but has few flowers this year. The blooms are powerful in color though. 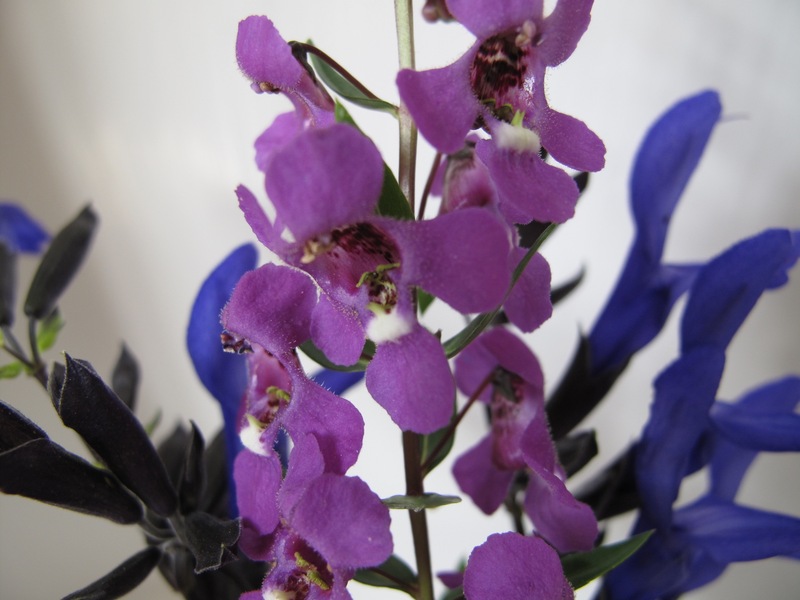 Angelonia is tough and reliable. 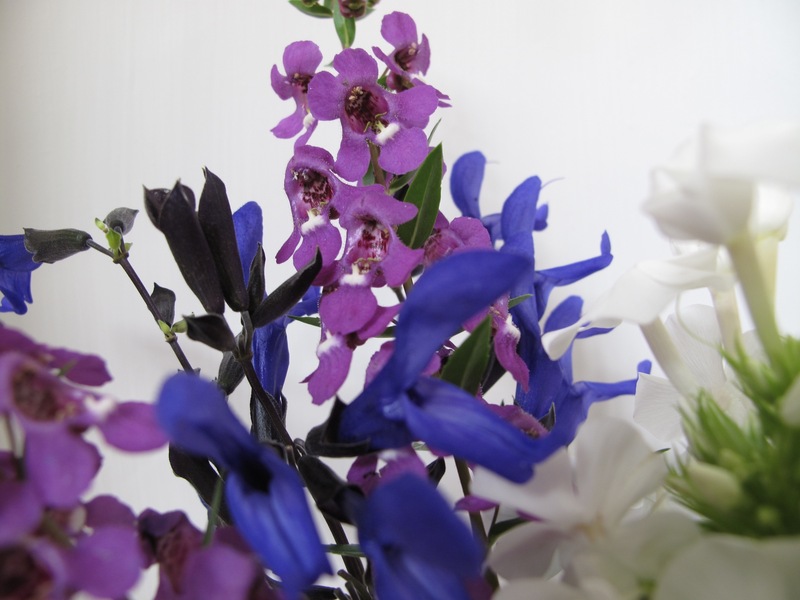 Even though your flowers are very pretty and eye-catching in these colours, I managed to look beyond them at that amazing alcove where you display them. That is a great ‘tokonoma’ to have in a home. I used to have something like it when we lived in a 17th century thatched cottage – where it was positioned in the small entrance hall. Made out of wattle and daub, and nowhere near as elegant as your niche with the fluted columns on each side. It really enhances any arrangement you care to position there. Thanks Joanna. I’d love to have flowers in the niche all the time but my husband got first dibs when we moved here as a spot for a bust of Thomas Jefferson. Cathy, the retreat was wonderful indeed. We practiced yoga 4 times, meditated, chanted, sketched/painted and just had fun. Over all too quickly. So crisp and dramatic…love it! Thanks Ricki, I think those deep colors add the drama.